in Sedinghausen village, province of Prussia, December 15, 1838. There he lived until he reached the age of twenty-nine years. Mr. Meis served his native country six months in the German army in the year 1863. In 1867, Mr. Meis left his native land for America by the way of Bremen, and was on the sea seven weeks in the steamer, "Zir-Casion." The captain of this vessel tried to sink the boat by boring holes in the bottom of the vessel, but was prevented. For this he was arrested and hanged a few days after reaching New York. There were eleven hundred people on board. The passengers received sixty-three dollars each from the steamship company. They landed at Halifax, then proceeded to New York, where the captain was arrested. After landing, Mr. Meis went to Dubuque county, Iowa, where he remained for three years, and then moved to Carroll county, Iowa, where he lived for twenty-three years. He then, with his family, came to Antelope county, Nebraska, March 1, 1893, and bought three hundred and twenty acres of land in the above-mentioned locality, where he and his family now reside. Mr. Meis was united in marriage in February, 1861, to Miss Mary Ehrich, who, four years later, died, deeply mourned by her husband and relatives and friends. Mr. Meis again married in September, 1867, the bride being Mary Godde, and Mr. and Mrs. Meis are the parents of a fine family of ten children, whose names are as follows: Thresa, Antone, Mary, deceased; Frank, Annie, Rosa, Louise, Joseph, Emma, and John, deceased. Mr. and Mrs. Meis and family in their long residence in this section of the county have well merited the popularity and friendship they enjoy in their community. Wesley Thomas owns a well equipped farm of five hundred and sixty acres in Custer county, and is known as one of the successful farmers and stock men of his region. He is a native of Grant county, Indiana, born October 28, 1860, the youngest of three children born to Milton and Susannah (Dilla) Thomas, and their only son. The mother died when he was a small child and his father afterward married again, but no children were born by this marriage. The father had been married before this union with Susannah Dilla, and she had also been married before. By his first marriage he had five children. He was an original homesteader of Grant county, Indiana, and if not a native of Indiana, was brought there when very young. He lived on that farm until his death, in 1878. Two sons by his first marriage, and one of the mother's sons were in the civil war. Wesley Thomas was reared on the farm in Indiana where he was born and gained his education in the public schools. He remained with his father until his eighteenth year. He came to Kearney, Nebraska, in July, 1883, and in December of the same year took up a homestead on section eighteen, township seventeen, range twenty-one, being still in possession of the original homestead. He was married in Custer county, April 29, 1888, to Mary Longfellow, daughter of Richard and Melinda Longfellow, and fourth born of their eight children. Mrs. Thomas came to Custer county with her parents during the summer of 1882, her father being an original homesteader there. The father was a native of Ohio and the mother of Pennsylvania, and prior to coming to Nebraska they lived in Illinois. The ancestors of Mr. Longfellow on the paternal line were from Germany. He died in Custer county in 1892 and the mother in 1902, being survived by five children, three of whom now live in Nebraska; John R., Mrs. Richard Bryan and Mrs. Wesley Thomas. Two sons, James E. and Richard Longfellow, live in the state of Washington. Mrs. Thomas herself became an original homesteader when she secured land on section twenty-five, township seventeen, range twenty-two, where she and her husband now reside. Both have passed through the days of pioneer hardships and privations and remember well the time when it was necessary, occasionally, to use the coffee grinder in preparing grain for making bread, the year of the drouth, and similar experiences. Both have assisted materially in forwarding the development and improvement of the county and state, and they have a wide circle of friends, by whom they are sincerely esteemed. Two children have been born to Mr. Thomas and wife, Ola and Susannah, both of whom were born in Custer county, Mr. Thomas has two half-brothers living in Nebraska, E. J. Thomas and David Weesner, Kincaid homesteaders in Blaine county. John A. Amsberry, a prosperous farmer and stockman of Custer county, is well known for his personal integrity and worth. He was born in West Virginia, September 11, 1850, second in the family of twelve children born to Francis E. and Lucy (Beard) Amsberry. The five sons: William, John, James, Frank and Floyd, all live in Nebraska, the first three in Custer county, Frank in Lincoln and Floyd in Bankleman. The seven daughters live in Custer county. The father, also a native of West Virginia, of English parentage, located in Custer county, Nebraska, in 1884, securing a homestead near Mason City, where his death occurred in 1899. The mother, born in Bedford county, West Virginia, was of Scotch-Irish extraction, and still lives on the home farm, being now (1912) eighty-five years of age. Mr. Amsberry grew to manhood on the Virginia farm, receiving his education in local schools. where he was employed at farm work. However, he was enthused with the liberal opportunities offered in the west, and in the spring of 1874 pushed his way on to Valley county, Nebraska, where he preempted one hundred and sixty acres of land near the town of Ord. After having his crops entirely devoured by grasshoppers in 1874, he returned to Iowa, but the lure of the west called him again and he located in Custer county in the spring of 1878, taking a homestead of one hundred and sixty acres of land on section thirty-one, township fifteen, range seventeen, where he has remained throughout the years that have since elapsed. He secured a timber claim adjoining, bringing both places to a high state of development and productiveness. He has been active in promoting various public measures, and was one of the organizers of school district number nine, serving several years on the board. At Knoxville, Iowa, on September 24, 1879, Mr. Amsberry was united in marriage with Miss Mary Buckley, a native of West Virginia, and daughter of Frank and Martha (Blaine) Buckley. Her father, a native of West Virginia, was killed in Iowa, February 15, 1869, while felling timber. Her mother was born in Virginia, and is living in Garden county, Nebraska. One son, Ambrose Buckley, lives in Cheyenne county, Nebraska, and two daughters, besides Mrs. Amsberry, Mrs. M. F. Ashworth, of Ansley, and Mrs. James Smith, living near Mason City, are residents of Custer county. Three children have been born to Mr. and Mrs. Amsberry: Zadee, wife of Ray H. Duke, of Mason City, has one son; Frank G. and Nellie, live at home. Mr. Amsberry is one of the early Nebraskans, and has passed through the many trying experiences and discouragements incident to pioneer existence. He was the fourth homesteader on Muddy creek, and is one of the best known men in his county. Throughout the years of his residence there, he has been identified with the best interests of the county and state. He is the friend of progress along all lines, and a successful man of affairs, being the owner of eleven hun-hundred [sic] and sixty acres of choice land, well improved and equipped for raising stock and grain. He specializes in thoroughbred Angus cattle, having a herd of over one hundred head of registered stock, and is one of the leaders in this line in the region. In 1889, he erected a commodious residence, one of the first frame houses in his neighborhood, and he has various substantial buildings on his farm, suitable for housing stock and various other uses. The first residence on this farm was a dugout, twelve by sixteen, and the cold winter of 1880 and 1881, two boarders were accommodated. On one trip to Grand Island that winter, Mr. Amsberry was delayed by the deep snow, and did not return for eleven days, causing much uneasiness in the household. After the dugout, a "soddy" was the family residence until 1889 when the neat cottage the family now occupies was erected. Several large barns complete the equipment of the place, and a modern system of water supply and sewerage was installed. A full-page view of this picturesque place is to be found elsewhere in this work. Mr. Amsberry was in the county early enough to secure his share of deer and antelope, and remembers when they crowded the hills in great herds. In 1894, the dry year, they raised a garden crop by irrigation, tomatoes and cabbage being especially prolific. In polities Mr. Amsberry is a republican, and he is a member of the Modern Woodmen of America. The family are all members of the Baptist church. 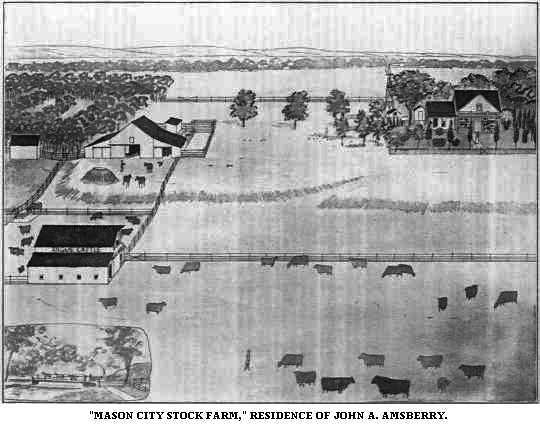 "Mason City Stock Farm," Residence of John A. Amsberry. This gentleman, a well-to-do retired farmer of Pierce county, Nebraska, enjoys a comfortable home with his family in the pretty little city of Pierce. Through many years of unremitting labor and good management, he has accumulated a very valuable estate, has been enabled to give his children a good education, and otherwise provided for their future chances in life. Joseph Zimmerer was born in the village of Friedlingen, in the Black Forest, province of Wittenberg, Germany, on April 14, 1847, and there grew to the age of seventeen years, following farm labor, and receiving a meagre education in the local schools. In March, 1869, he embarked at Bremen for the United States, landing safely in New York, after a tedious voyage of three weeks, and proceeded direct to Ohio, where he joined a brother who had preceded him there. Here the brothers teamed until they met a visitor from Nebraska, who had wonderful tales of the high wages being paid in that country, and decided to try their fortune in the great west, after two years' sojourn in Ohio. On arriving at Nebraska City, they found that freighters were receiving but twenty dollars per month, instead of seventy or eighty, and their dreams faded somewhat, but our subject, secured employment as a driver in a train of freight wagons, going as far as the Bishop Ranch, at the western limits of the state, south of the Platte, where he left the outfit, and returned to Nebraska City, obtaining farm work there, at which he was employed for two years, followed by a short sojourn at Watson, Missouri, working on a section of the railroad. hundred and sixty acres west of Pierce, engaging in general farming until 1908, when he moved to Pierce, retiring from active work. He has a comfortable residence and sufficient property, which he has accumulated by years of hard labor, to enable him to spend the remaining years of his life in comfort and freedom from care. To Mr. and Mrs. Zimmerer have been born the following children: Annie, Mattie and Louis, who are. deceased; Adolph, farms part of the home place, northwest of Pierce; Joseph, is farming in Pierce county; John, lives near Humphrey, Platte county; Gertrude, Matilda and Charles, all well settled in life. Mr. Zimmerer is a democrat, and takes all active interest in local affairs, although he never sought public preferment. With his family, he has been for years a member of the Catholic church of Pierce. John Johnson, who for many years past has followed his trade as a carpenter in and around the city of St. Paul, Nebraska, is known through that section of the country as an industrious and capable workman, and good business man. He has prospered in his chosen career, in that he has accumulated a comfortable property, consisting of a valuable tract of land near his home city, and some town property, including the residence which he occupies with his family. Mr. Johnson was born in Sweden, December 11, 1862, and remained in his native land until he was twenty years of age, as a boy learning the carpenter and builder's trade. In June, 1882, he accompanied his parents and a brother to America, landing in Quebec, Canada. They came directly to the states, crossing the country to Nebraska, and their first location was in Howard county, where the father took up a homestead ten miles north of St. Paul, although they remained in the town, which was then small. Our subject began working for the railroad, remaining with them for a few months, followed his trade for a time, and finally returned to the road, and continued in that work, moving with his family to Granger, Wyoming. There he was employed by the Union Pacific Railway Company as section forman and remained in that state up to 1901, in which time he returned to St. Paul, and engaged in the carpentry business, which he has followed steadily ever since. He has assisted in erecting many of the buildings here, also a huge number of the finest residences. On June 19, 1884, Mr. Johnson was united in marriage to Miss Mary Johnson, also a native of Sweden, she coming to America with her parents in the same year its our subject. They have had seven children, six now living, named as follows: Axel Bernard, who is in engineer, and lives with his family at Topeka, Kansas; Dora, Ella, Lydia and Bessie, living at home, and Emil, now in Laramie, Wyoming. The entire family is well known in and about St. Paul, and all enjoy the esteem and friendship of the entire community. Mr. Johnson was the fifth child in a family of nine, and his parents both reside in St. Paul at the present time, highly respected as worthy citizens, and early settlers in Howard county. An honorable position among the pioneer settiers of central Nebraska is readily accorded to this gentleman by every one with whom he is acquainted. He occupies one of the large and well-improved farms of the county, and is greatly respected in the community where he now lives, which is on section twenty-three, township nineteen, range fourteen, Valley county, Nebraska. Solomon O. Hubbard was born on a farm, twelve miles from Jamestown and twelve from Maysville, Chautauqua county, New York, July 3, 1842, and was the youngest of five children in the family of Samuel and Eunice (Conklin) Hubbard, who had four sons and one daughter. Mr. Hubbard is the only living member of the family. The father, mother and family moved from New York to Knox county, Illinois, January 1, 1854, going overland by team. They remained in Knox county for about five years, then moved across the line to Henry county, near Galva. Mr. Hubbard enlisted in Company G, One Hundred and Twelfth Illinois Volunteer Infantry, August 15, 1862, and received his honorable discharge, June 20, 1865, being corporal of his company at the time. He was with Major General A. E. Burnsides, with Major General J. M. Scofield in Kentucky and Tennessee, and with Major General W. T. Sherman as far as Atlanta, and at the close of the war with Major General George H. Thomas, holding Hood in check at the west. He participated in one hundred and ten skirmishes and twenty-five general engagements. He was in the battles at Monticello and Richmond, in Kentucky; Calhoun, Philadelphia, Campbell Station, Knoxville, Bean Station, Dandridge, Kelly Ford, Muddy Creek and Nashville, in Tennesse; at Resaca, New Hope, Kenesaw Mountain and Atlanta, in Georgia; at Fort Anderson, Wellington and other North Carolina engagements. After his discharge, Mr. Hubbard returned to Henry county, Illinois, but remained here only about a year, when he moved to Iowa, where he lived until 1870, in Scott and Powishiek counties. fall of 1901, and purchased the west half of the northeast quarter and the east half of tbe northwest quarter of section twenty-three, township nineteen, range fourteen, which remains the home place to this date. A fine nine-room house was constructed in 1911, a dwelling in strong contrast with the sod dugout that was the family residence the first few years. Mrs. Hubbard died in Fillmore county, May 29, 1887, deeply mourned by many friends and her husband and family. Mr. and Mrs. Hubbard had six children born to them: Grace Lillian, wife of Tom Lancaster, who has eight children, and resides near Ord, Nebraska; Martin J.; Elma and Nettie, both of whom are deceased; George W., who is married, has two children, and lives on a farm near his father, and Myrtle Celestia, who was married to Joseph Stanton at Grand Island, March 14, 1905, lives on section thirty-two, township twenty, range thirteen, they have two children, William G. and Elma Myrtle. Mr. Hubbard has made several pioneer moves into new country by the overland route, and assisted in developing new territory. He is a self-made man, who has had a wide and varied experience, a man honored and respected. He remembers a number of the memorable blizzards of the early days, and saw deer and antelope while living in Fillmore county, at which time a few buffalo were killed along the Republican river. Mr. Hubbard is a member of the Modern Woodmen of America. Burrell E. Reed, one of the old settlers of the region where he chose his home in the early days, occupies a good home and valuable property in section four, township twenty-three, range one, in Madison county, Nebraska. Mr. Reed is a native of the Keystone state, his birth occurring December 21, 1841, and he is a son of Whipple W. and Lyda (Colvin) Reed, both natives of Rhode Island, and of English parentage. He grew to manhood in his native state, receiving the usual school advantages. Mr. Reed served his country in the civil war, enlisting in 1861 in Company I, Fiftieth Pennsylvania Infantry, under Captain Buzzard, and served under General Stephens. He participated in the battles of Knoxville, Port Royal, Bull Run, Vicksburg. Battle of the Wilderness, Petersburg, South Mauntain, Antietam, and the Siege of Richmond. He was in many of the hardest battles of the war, and underwent many hardships. He received his discharge in August of 1865. During his service, Mr. Reed was wounded at Petersburg, June 17, 1864. From his native state, Mr. Reed first came to Iowa, remaining there four years. Then driving from there to Madison county, Nebraska, in 1870, took up a homestead claim, on which he built a log house. He also took up a timber claim. Later, he sold his place, and bought the Nick Gardner farm, and now has two hundred and twenty acres of choice land, sixty acres of which are set to trees, making one of the finest groves in this section of the county. In the very first days of settlement on the western frontier, our subject and his parents suffered many hardships and privations, and had to brave many dangers. Among other sources of anxiety, the prairie fires that often came upon them almost unawares were not the least. The grasshopper pests that came in clouds and swooped down on the fields of splendid crops, of which they destroyed every spear, were another source of discouragement, driving some of the few settlers almost to despair. These pests destroyed the entire crops of our family for four consecutive years, which caused much inconvenience and almost utter privation. In 1894, our subject was subjected to severe losses through the hot winds that were caused by the drouth, and in 1902, hail was a medium of destructiveness, having killed about all the fruit trees in that region. Deer and antelope were plentiful in those early days on the open prairies, and frequently could be seen grazing around in herds. Mr Reed was united in marriage, February 3, 1869, to Miss Minerva Ransdell, who is a native of Indiana. Mr. and Mrs. Reed are the parents of twelve children, whose names are as follows: Ida, who is the wife of Charles Murphy; Frank, married to Miss Rosa Clayton; William, whose wife was Miss Pittman; Harrison; Charles; Bert, who was married to Miss Nellie Hallman; Liddie, who is the wife of George Woodruff; Ella, Emma, Stephen, Robert and Dora. They are a fine family, enjoy the respect and esteem of a large circle of friends, and are members of the Presbyterian church. Mr. Reed is a democrat. John Frederick, prominent in Custer county's financial circles, as president of the Farmers' State Bank, of Callaway, has helped build up one of the sound and reliable institutions of central Nebraska. It was organized November 27, 1906, with a capital of forty thousand dollars and a surplus of eight thousand dollars, and does a general banking business, having deposits aggregating over eighty thousand dollars. Its officers are: John Frederick, president; vice president, T. H. Fonda, and cashier, John Frederick, junior. married in Allen county in 1857. In 1861, Peter Richardson with his wife and two children, came to Richardson county, Nebraska, and both parents now live at Falls City, retaining ownership of the original homestead farm in Richardson county. He established the first pork packing business in Nebraska, in 1862, transportation of its products being carried on entirely by boat. They were one of the very early pioneer families of the state, and closely identified with the history of the development of the eastern part of the state. They were connected with the business life of their region as well, being there before Nebraska was admitted as a state, and remaining until the present time. They are active and robust in their old age, and enjoy the esteem and regard of a large circle of friends. Of the thirteen children born to them, eight are now living: Joseph, of Richardson county; Carrie, Mrs. John Schulenberger, of Richardson county; Charles, of St. Louis, Missouri; John, of Callaway; Mary, Mrs. Bladen, of Denver, Colorado; Peter, junior, of Richardson county; Edward and Lucy, Mrs. Louis Shawang, also of Richardson county. John Frederick reached manhood on the old Nebraska homestead of his father, and was married in Richardson county, December 25, 1884, to Amanda Sellers. He had made a trip to Custer county in July of that year, and looked over the country, and, after marriage, he and his wife came at once to Custer county, taking a pre-emption in the southwestern part of the county, their home for many years. He paid up his pre-emption, and in the spring of 1886 took a homestead in the same neighborhood, and carried on farming until 1891. He then moved to a farm four miles north of Callaway, and in 1893 came to Callaway, and engaged in buying, feeding and shipping stock, which has practically been his chief business since 1891. He still carries on this enterprise in connection with his other business interests. For many years he has been one of the most prominent business men in the vicinity of Callaway, and is well known as a stockman in the central part of Nebraska. He and his family are widely known, and are active in social and educational circles. Besides his interests in Callaway, Mr. Frederick is president of the Peoples State Bank of Arnold, Nebraska. He has been the friend of progress throughout the years of his residence in Custer county, and has done his share to help along various measures for the general welfare and prosperity. Mr. and Mrs. Frederick have eight children: John, junior, cashier of the Farmers' State Bank, is married, and lives in Callaway; Lilly, wife of Albert Ogden, of Seward; Charles W., married, and living in Arnold, is cashier of the People's State Bank there; Hazel, Edward, Ida, William and George. All were born in Callaway, except John, who was born on the homestead farm. Perseverence and good management, supplemented by honesty of word and deed, have placed this gentleman among the foremost farmers of Wayne county, Nebraska. For nearly thirty years he has been a resident of the state, where he chose his home in the early days. He has a comfortable home, pleasantly located in section eleven, township twenty-six, range four. Mr. Rubeck is a native of the state of Illinois, where he was born, November 2, 1864, the son of P. J. and Listien Rubeck, both originally from Sweden. Mr. Rubeck spent his childhood in Henry county, and obtained his education in the local district schools there. In 1881, he came, with his parents, to Lucas county, Iowa, where they remained over three years. In 1886, the parents came to Thurston county, Nebraska, this time staying until 1891, when they moved to Oakland, Nebraska, where they died, the father in 1901 and the mother in 1906. Henry Rubeck moved to the western part of Nebraska in 1884, and stayed about a year. He then went to Thurston county, Nebraska, and remained one year, during which time he proved up on a homestead there, after which he was employed at railroading for nearly three years. He then farmed his homestead in Thurston county, Nebraska, until 1891. Mr. Rubeck came to Wayne county in 1891, which has been his home ever since. He had, during the previous year, bought the farm which he occupies at the present time. The farm has been improved since it passed into his hands, and now every appointment speaks of industry, thrift and good management. There was not a fence post on the place when Mr. Rubeck bought it, and only eighty acres had been broken. He has built a good house, barn and other buildings, and fenced the place. Since coming here, he has added forty acres to his original purchase, and now owns two hundred acres of land. Mr. Rubeck was married in 1890 to Miss Hattie Erickson. They have had nine children born to them, all of whom are living. They are named as follows: Florence H., Harvey R., Alvin R., Pearl O., Sylvia R., Henry W., Hattie M., Paul A. and Floyd L.
Mr. and Mrs. Rubeck and family belong to the Swedish Lutheran church at Wakefield, and Mr. Rubeck is a republican. Among the prominent and successful business men of Clarks, Nebraska, we wish to mention the name of William R. Morse, who is well known all over the surrounding country as a man of ability and a citizen of true worth. nah (Reed) Morse, who has three sons and one daughter. Mr. Morse comes from old New England stock, the families of Morse and Reed dating their lineage back to about 1700, the Morse family originally coming from northern Ireland, and the Reed family from England. Mr. Morse lived in the state of Maine until about his twenty-first year, receiving the common school education, and one year's academic course. He is practically a self-made man, going out in life in his younger years, and his father having died when our subject was but a lad. Mr. Morse came west in 1868, locating in Champaign, Illinois, where he became connected with a general mercantile store. On March 20,1872, at Champaign, Illinois, Mr. Morse was married to Miss Emma Thomas, a native of New Jersey. Immediately after marriage Mr. and Mrs. Morse came to Nebraska, landing in Clarks, Merrick county, March 28, 1872, which town had just been established the fall prior to their arrival. Here Mr. Morse took up a homestead, and was one of the first business men in Clarks, erecting the second business house in the town. He at first was in partnership with Doctor Martin. Mr. Morse has been actively identified with the growth kind development of Merrick county, always up and doing for the advancement of the town of Clarks, and is progressive along all lines for the building up of Nebraska interests. He is now engaged in the real estate and insurance business, and is a man of known integrity, having the respect and esteem of the business public. In 1880, Mr. Morse was elected to represent his district, eighteenth senatorial, in the state senate, where he made good as an able legislator. He is connected with the Ancient, Free and Accepted Masons lodge, and also the Knights of Pythias. Mr. and Mrs. Morse have had six children born to them: Nellie, who is married to Reverend H. J. Hinman, resides in Cresco, Iowa, and has three children; Clara, who is married to J. W. Larkin, a merchant of Plattsmouth, Nebraska, has one child; Ralph C., married and living at Longmont, Colorado; Harriet H., married to Dana D. Little, junior, a farmer of Merrick county; Mollie E., married to Doctor C. H. Campbell of Columbus, Nebraska, has one child; and Harold M., a student. Mr. and Mrs. Morse have a fine home in Clarks, and the family are well known in social and educational circles. They are a pioneer family and the children were born in Merrick county. Mr. Morse has been active along political lines, and is widely known. He has always been a republican. At the present time he is president of the Clarks school board, and is a prominent factor in the affairs of this portion of the state. A citizen of Nebraska through all but his earliest boyhood years, Albert A. Manke, one of the progressive lumber dealers of Bloomfield, is thoroughly western in all his traits and disposition. He was born in west Prussia, March 25, 1871. His parents, Fred and Charlotte (Reichwaldt) Manke, emigrated from west Prussia to the states in 1872. Sailing from Hamburg, they landed in New York and proceeded direct to Calumet county, Wisconsin. Here the father farmed until 1879, when he decided to migrate to the Nebraska country, of which he had heard so much. Loading his possessions into a wagon, he started with his family across country, camping by the wayside at nights. The trip occupied about four weeks, their destination being reached on the Fourth of July. The father settled on a homestead in Cleveland township about ten miles southwest of Bloomfield. He afterwards sold the homestead and moved to his timber claim in the same township, and here he lived until his death, his wife having died on the homestead. Albert A. grew to manhood in Cleveland township. His first schooling in Nebraska, was obtained in a small frame building known as the Kemma school. Later he attended the Fairview school and the German parochial school at Bazile Mills. The boy remained with his father until nineteen years of age, when he clerked for a time in Creighton, and secured work on neighboring farms from time to time. He had been working for a man in the Indian reservation at the time of the location of the Bloomfield townsite. His employer, H. J. Paulsen, was the first to move to town and, with the boy's help, erected the first building in the new village, a building now serving as the laundry of the Commercial hotel. They ran a hotel and livery at the opening of the town, and until the hotel building was completed, the barn was occupied - horses in one end, while a dining room and kitchen was partitioned off in the other. For sleeping quarters, they used the loft. The rough cottonwood lumber was hauled from Lee's sawmill on the Missouri river, and the finishing lumber was hauled from Hardington, Mr. Menke doing most of the teaming, sleeping in the open before the barn was built. A hay rack was the first feeding place before the stable was erected. The building which is now used as a laundry, was first erected in the street that it might be moved when the lots were sold, as no one knew at the beginning who the purchaser of any lot might be. Mr. Menke was employed to plough furrows around each block to show where the streets lay. Edwards & Bradford Lumber Company, after which he found work in the elevator for two or three months. In the meantime, Mr. Jones and Mr. Calkins bought a competing yard, and sent for Mr. Manke at once. After a few months here, he went to Wayne, to take at course in the business college to fit himself for office work and eventually to take charge of the business for himself. The summer following his business course, Mr: Manke spent on the home farm until Mr. Calkins sent for him to resume his old place, hereby giving testimony to the efficiency and honesty of the young man. Here he remained for ten years, saving his money and investing it in land to go into business for himself. Mr. Manke disposed of his land, and on March 17, 1903, in partnership with Mr. Fred Uhling, bought the Edwards & Bradford yard, this being the place where he first started working in the lumber business. Two years later Mr. Manke bought his partner's interest, and has since. conducted the business as the sole owner. He carries a full line of lumber, coal, paints, oils, varnishes, etc. Mr. Manke was married at Bazile Mills, May 6, 1867, to Miss Emilie Filter, who was born in Germany, a daughter of William and Johanna (Drager) Filter, who emigrated to America and settled in Knox county. Seven children have been born to Mr. and Mrs. Manke, namely: Agnes, Albert, Hilda, Martha, Adaline, Elmer and Edwin. Mr. Manke is a liberal republican, voting on all but national tickets for the man, and not for the party nominee. With the family, he is a member of the German Lutheran church. During the blizzard of January 12, 1888, Mr. Manke was at Bazile Mills and weathered the storm at that place. During the flood of March, 1881, when the deep snow of the previous winter went off, the elder Manke came near losing his life by drowning, in Bazile creek. They lived in a dugout, as many of the early settlers did, and when fuel was scarce and the price of corn low they burned many bushels of that product. One humorous incident of the early days was the false alarm of an Indian uprising. An old bachelor started the fright, taking alarm at some charivari celebrants. Mr. Manke's family was one of the first to take alarm and seek a place of safety. Mr. Manke is a self-made man, having earned nearly every dollar he owns, and is recognized as one of the most substantial and reliable business men in the town. Lorenzo P. Dufoe, retired farmer, son of Oliver and Lucinda (Dyer) Dufoe, was born in Rockford, Illinois, October 18, 1847. He was fifth in a family of thirteen children, and has one brother and a sister residing in Iowa, one brother in Minnesota, one brother and one sister in Boone county, and the others are deceased. The parents are deceased, the father having died in 1905, in Iowa, at the advanced age of eighty-seven years; and the mother died about 1859. In 1858 the family went to Iowa, engaging in farming, etc., and on September 25, 1870, our subject was joined in holy wedlock to Miss Lovina Rearden, of Iowa, and in the spring of 1873 came with his wife and son overland to Boone county, Nebraska. They were five weeks making the trip, as it rained most of the time and the Elkhorn river was too high to ford. Here he homesteaded one hundred and sixty acres of land in the southeast quarter of section fourteen, township eighteen, range seven, which remained the home place until August, 1904, when Mr. Dufoe retired from farm life and moved to Cedar Rapids, where he built a good home which is their present residence. He has been prosperous and successful, and owned at one time nearly a section of land aside from good town property. He has divided his farm with his children. Mr. and Mrs. Dufoe have had four children born to them, three of whom are living, whose names are as follows: Arthur E., who is married, has one child and lives in Cedar Rapids; Evelyn, is married to John Darling, has four children, and also lives in Cedar Rapids; Earnest L., who lives four miles southeast of Cedar Rapids, is also married; and Deloran T., who died in 1897, aged nineteen years. Mrs. Dufoe's father, John Reardon, died in the army, and her mother died December 14, 1900, in the state of Iowa. One brother lives in Seattle, Washington, one in Iowa, and one, John Franklin Reardon, resides four miles southeast of Cedar Rapids, Boone county, Nebraska. Mr. and Mrs. Dufoe are among the earliest settlers of Boone county, and have passed through all the experiences and hardships of pioneer life, and are widely and favorably known. To the men of perseverance and firm determination who came to Nebraska when it was yet undeveloped as an agricultural and commercial region, the present prosperity enjoyed there is due. Among the early settlers of Antelope county who have been intimately identified with its development and has gained an enviable reputation as a citizen may be mentioned Chester Field, a retired farmer living in the village of Royal. Mr. Field is a native of Jefferson county, New York state, born February 2, 1832, and came to DeKalb county, Illinois, when he was fourteen years of age, and lived there a number of years as a young man, then went to Clayton county, Iowa, remaining there ten years, coming to Norfolk, Nebraska, in 1873, and remained there until 1880.